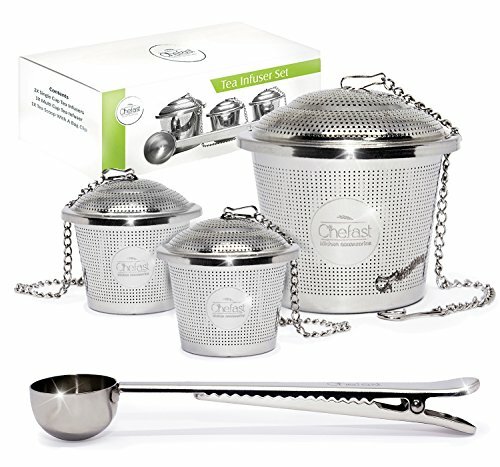 Built To Last: With solid construction of 304 grade stainless steel, this mesh tea infuser set by Chefast™ is guaranteed to be a staple in your kitchen for a long time to come. Cleaning Is a Breeze: All you need to do is rinse it under cool water, and you're ready to steep another batch. These infusers are also dishwasher safe. A Perfect Gift: You'd be surprised how many people simply aren't aware just how good their tea can taste if it's properly steeped. Share the tea taste sensation with them every day - gift them this tea infuser set on the next special occasion or for no reason at all. They'll love you for it many times over! One-Year Warranty: We stand behind our tea infuser set with a full one-year warranty. If anything goes wrong, a replacement is just a few clicks away. When It Comes To Preparing Premium Tea, Make Sure You're Using Premium Tools. We promise that you and your guests will be able to taste the difference. Order One Or Several Of These Tea Infuser Sets Today! If you have any questions about this product by Chefast, contact us by completing and submitting the form below. If you are looking for a specif part number, please include it with your message.